As I write this, I am unable to concentrate on anything... My thoughts keep leading back to the day my husband is experiencing and the uncertainty that lies within me. My stomach is in knots and I feel, well, once again helpless. Kev is currently undergoing an all day TBI screening and testing. When he was in Iraq he was caught in the middle of more IED's than imaginable, running constant missions throughout the day...everyday. On one of the missions this truck was hit hard by an IED and he was sent flying from the turret (he was a gunner). During this explosion he was knocked unconscious and has had multiple problems since then. The doctor explained to us that him being unconscious actually saved his life. Had he been alert through this ordeal, he would not be here now. 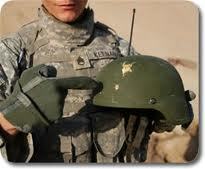 Being knocked out his body was not in tense, which in return kept him alive....battling TBI. This is the second time he has had to undergo something for his TBI. The worst part, I have no idea what today has in store for him. Scratch that, Kev just called me while on his lunch break. My heart is breaking right now because he is struggling with this screening. He is having fits and I fear an emotional breakdown coming on. He is so tense and angry and I just wish there was something I could do. He said that he had a questionnaire of about 500 questions to start the morning off. Then he met with one of the women that started his testing. She would ask him to remember words or phrases, then ask him about an ten minutes to an hour later and he could not recall. She would ask him to repeat number sequences after her, he could not remember them. She told him to arrange blocks in certain patterns and different areas... he struggled with this as well. There were many other tests and questions involved, yet I cannot recall them as of now. I am sure I will write more tonight once I hear about the afternoon portion of this screening. He is so full of frustration, irritation, and anger that he smoked three cigarettes in the first ten minutes of us talking. He has his "I don't care" attitude and just ready to get away from it all. He said he felt like he was at his breaking point. I could hear him on edge as we talked... more so that I have heard in such a long time. Hearing my husband like this breaks me. I feel helpless, worried, anxious, sick to my stomach and more. I want to go in there and shake the docs for putting him through this. I know that it is part of the testing and I know it has to be done. Yet, it still leaves me feeling angry. I want to shout at them to just stop, to quit putting someone that has such severe PTSD through this TBI testing. But, I know they can't just stop. This is part of it and has to be done. He is getting frustrated and feels "stupid" because he can't remember anything.... How do I make him know this has nothing to do with his intelligence and everything to do with his brain injuries? He is one of the most intelligent people that I have been blessed to know. I can't stand hearing my husband like he is now and it rips my heart into pieces. I just want to make it go away. I want to take away these memories from Iraq and the war. I want to turn him back into the man he was before he deployed in 2007.... except for the open man he has become. I love the part of him that now communicates with me and shows me the affection that he does. It just seems so unfair to see someone struggle through so many things that come with the aftermath of the wars. Tonight he has to report to the sleep study again for his second sleep study. A few weeks ago he was diagnosed with sleep apnea. Having over 123 episodes within a six hour period. A lot of snoring, tossing and turning, sweating, loss of breathing, shallow breathing, and pillow flipping occurred last time. His diagnosis is complete, now they want to look for other things as well as work on the treatment plan with the mask. I cannot remember what it is called right now. I honestly think that they do the testing like they do just to see the level of frustration that occurs. Not that it's right, but it seems to help their diagnoses. If he has already done the questionnaire and the word test, I think it's mostly just the smell test and the brain scans (it's been a couple of years since my husband had his so I am going off my poor memory). The sleep apnea must be another, unrealized, side effect of the TBI, my hubby has it bad too and has to use a CPAP machine at night. Once he started sleeping through the night with it though, his moods were a bit better and his memory improved some. Hope that everything works out for you guys! You are right, the testing does help their diagnoses. But, the psych eval also brings on a terrible few days of flashbacks and reliving the moments of war and bad mood swings from all that they experience while undergoing the testing. My husband will receive the CPAP machine in the next few days. We are just waiting on the company to issue him one since it has all bee done off post. I am hoping he adjust to it without too many problems! Thank you for your comment and well wishes!